PHO! Is there anything better than slurping up a big bowl of delicious brothy noodles? The answer is no. Soupy, slurpy, full of gorgeous flavours from star anise, cloves, cinnamon, garlic and ginger, topped with basil, mint, cilantro, and all sorts of other goodness. A total bowl of health. This baby will make colds run away in horror. Traditional pho is supposed to take several hours to make, but let’s be honest, I ain’t got time for that. So I figured out a cheaters way (aka brilliant way) to make it in just 30 minutes. Not only that but you get to be all sorts of lazy and just toss everything in a pot and let it simmer. I totally have time for that! 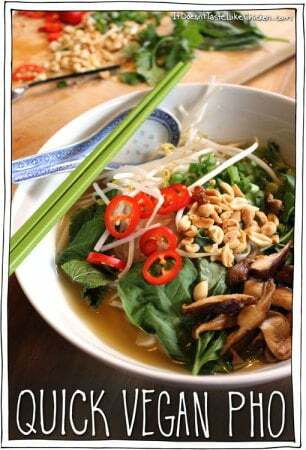 Pho is all about the broth, and the broth is all about the right flavours. 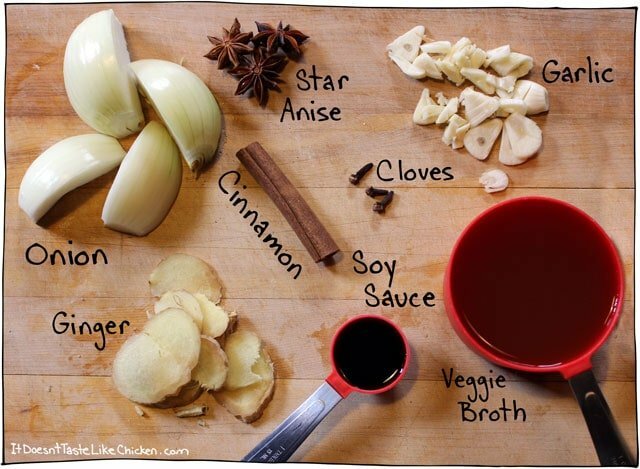 Pho’s unique flavours can be attributed to the spices: star anise, cloves, and cinnamon. Often used as a sweet combination, but pair them with onion, garlic, and soy sauce, and oooeeee is that the yummiest savoury, aromatic soup ever! 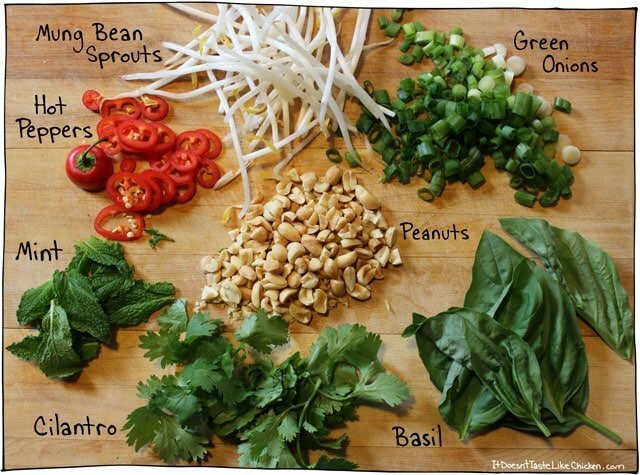 Then just decorate your pho with an endless combination of toppings. I love serving all the toppings on a large cutting board or in individual pretty little bowls, and then letting everyone top their pho to their own taste preferences. It makes for a great dinner party or just an easy weeknight meal. To make quick vegan pho, just quarter an onion, roughly chop the garlic, and slice the ginger into coins. Add the broth, onion, garlic, star anise, whole cloves, ginger, and cinnamon to a large pot and bring to a simmer. Cover and let simmer for 20-30 minutes. Yes, you will have large chunks of stuff floating around, thats how it should be. In the meantime bring a big pot of water to a boil and cook your rice noodles. Follow the package directions or if there are none, cook until al dente, about 3 minutes. Drain, and rinse with cold water to stop the noodles cooking. Ahhhhhhhh…. This is the stuff of love. A total bowl of health. This baby will make colds run away in horror. Add the broth, water, onion, garlic, star anise, whole cloves, ginger, and cinnamon, to a large pot and bring to a simmer. Cover and let simmer for 20-30 minutes. Taste and add soy sauce as needed. The amount you need will vary a bit depending on your taste preference and how salty the broth you used is, I used 2 tablespoons. Bring a big pot of water to a boil and cook your rice noodles. Follow the package directions or if there are none, cook until al dente, about 3 minutes. Drain, and rinse with cold water to stop the noodles cooking. When everything is ready, serve by adding noodles to a bowl, using a ladle to collect the broth (leaving the onion and spices behind), and then top with garnishes of choice. Feature Ingredient: Star Anise! 188 days, 69 Recipes to go. Yes, although from my experience it loses a bit of the punch, so you might want to bump up the spices a bit. Enjoy! For this recipe, the tofu would be excellent prepared the way I make it for my ramen noodle soup. You’re most welcome, I’m glad you enjoyed it! This recipe is lovely, and truly easy to follow exactly (or make your own variations. I don’t strain the broth, and add peanut butter rather than peanuts). Thank you so much! Thank you for the recipe. Curious… am I able to throw in the vegetables (broccoli, mushrooms, etc) and the noodles and cook in the broth all together? Hi Lil, sure you can. That’s not how pho is served, but if that’s the way you want to eat it, go for it! My boyfriend made us this recipe last week and WHAT A HIT! Since moving to Australia, we have found it VERY hard to find pho and impossible to find it vegan/vegetarian (always made with real beef stock!). So happy we found this recipe and will be making it again for sure! Where do you live? There are a couple with mushroom broth and no MSG in Twin Cities. Absolutely delicious! Made your veggie scrap stock as my base and it was great. I’ve got some broth leftover so I’ll leave it to sit overnight and I’m sure it’ll infuse even more. Thanks for this great vegan recipe! This was super good and so easy to make. Thanks for sharing! Thank you!!! 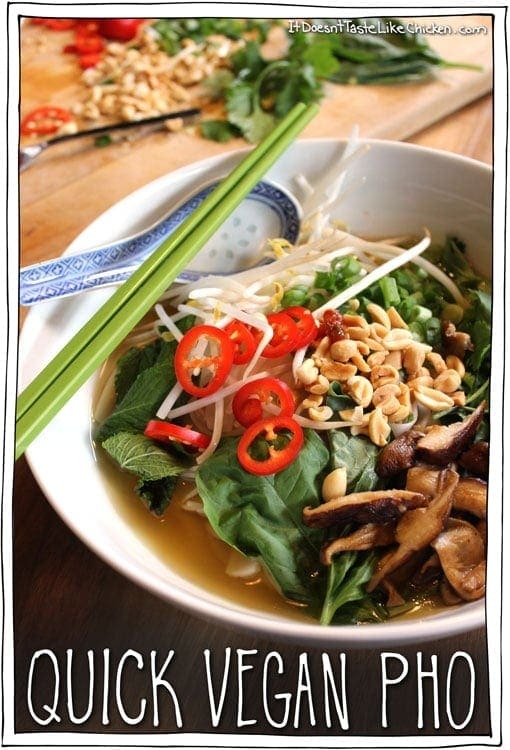 Pho is my new addiction – loooove ramen and now I can add this to my home meal list! I just fed this to a family of 7 adults and 1 toddler, 6 of whom have the flu, who are all picky eaters and they loved it and some went back for seconds as well. It tastes amazing. It is versatile for this family of meat eaters and pesceterians to add a protein source on the side. I opted to leave out the soy sauce and it was still great. I’m considering making a version with zoodles. This pho is incredible! Thank you so much for this recipe, it is a keeper! I tried this and if you want good flavor, double the spices. Also let it sit overnight after a boil, and the next day you’ll have your best flavor. We added some natural sweetness with a little can of pineapple tidbits (100% pineapple- no additives). What hot sauce do you use please? I’m in Australia, so I’m not sure the sauce choices will be the same, so any help regarding the content of the sauce would be greatly appreciated. Any Asian type hot sauce would work. I like Sriracha but you could also use a Thai chili hot sauce, or anything along those lines. Omnomnom! My husband and I love pho, and usually get takeout or use a pre-made vegan pho base we’ve found online…but I wanted to try to make it myself, and as usual, the most appealing (and easiest) recipe was on your site Sam. Made it tonight, and it was delicious!! The broth was fantastic, so flavorful even after a relatively short time simmering. Thanks!! On an unrelated note, I’m going to make the almond snacking cheese, tomorrow, so excited to try it! Oh no! I hope you feel better, Whytney, and I hope the soup helps you! love your recipies! Just made this, it was super good, and a big hit with my boy friend. I’m sure I’ll make it often. I was a little bummed after spending $35 on this recipe for the whole cloves, star anise, and fresh herbs that this wasn’t better. It really didn’t compare to pho from a restaurant and I made it exactly as stated. It was definitely good, but not restaurant pho good. I wish someone had commented when I read this recipe about the high price of the ingredients as that would have swayed my decision about whether to make it or not. Oh no, so bummed you didn’t love it, Fiona. All spices tend to be pricey, but the good news is that once you stock up, you will have them for a long time and can use them in many other recipes. Switching to vegan cooking can be time consuming and expensive. Even after you have stocked up on spices and other new ingredients, it isn’t cheap. I go to our local farmers’ market to help keep down the expense, but not everyone has that luxury. II would encourage you to stay with it and you will see the many benefits. I know when I started (21 years ago), many a time I bought a box of tofu only to throw it out after its expiration date because I didn’t know what the heck to do with it. Just a thought, but whole cloves and star anise can be used in make a chai mix or sangria or mulled wine. Hang in there!!! This is my my and just what you need when you are battling a cold! I am going to make a double or triple batch of broth and freeze extra next time. By the way – your tofu crumbles work great in this recipe! Oh dear, I see my general condition impacted my ability to type. I think I intended to say, this is amazing. I made this for dinner tonight. I was amazing! I bought some shrimp for my meat eating boyfriend’s portion since he was such a good sport in eating vegan last night (And tonight he said yes to pho without even knowing what it was). I didn’t have star anise so I threw some fennel in instead. I also used red pepper flakes and saracha at the end to spice it up. Yum! I will be eating leftovers for lunch. OMG! Thank you! I have been craving pho. Now I know at least one meal I’ll be making this week! Just made this for my omni family and they were so impressed!! So satisfying to give them vegan food and have them enjoy it so much, will definitely be making this again! I made this last night! was so good. Thanks for the recipe. Great Recipe! You have mastered this dish veggie style, and I love it! AMAZING!! Thank you soooo much. The only thing I do have a question on is the 3 cups of water. Is that meant for the broth? I added it and felt like I had to simmer it for another 20 mins or so to increase the flavors. But in the end it was soo good. Better than the vegan pho I’ve had at some places!! Thanks a bunches. Yes, the water is to thin the broth a bit. It sounds like the vegetable broth you used was maybe a bit milder in flavour that the one I used, so if you like you can skip the water or add it to taste next time. So happy you enjoyed it so much! Oh my goodness! Absolutley delicious!! So happy you enjoyed it Jennie! Just made your recipe! Loved it! I tried this last night and loved the results! I added a dried wild mushroom mix to the base for some extra flavor. Great recipe, thanks so much for sharing! I definitely need to give this Pho a try. Thanks for sharing the recipe. So happy you found my site Naiomi! I hope you and your family members enjoy the pho! Thanks for the recipe, very easy and very tasty… Enjoying mine right now! Super tasty. I made this tonight for my boyfriend and his boss and went down a treat. Thanks for the recipe! omg I cannot wait to make this tonight!!! Thank you! Made this for malaysian meat eating son in law for breakfast today. His comment “this is seriously good. Can we have this every week?” Thank you Sam for these really excellent recipes. Haha! I love that. You know it’s not the first person I have heard who eats my pho on a weekly basis! (I am one of them!!). 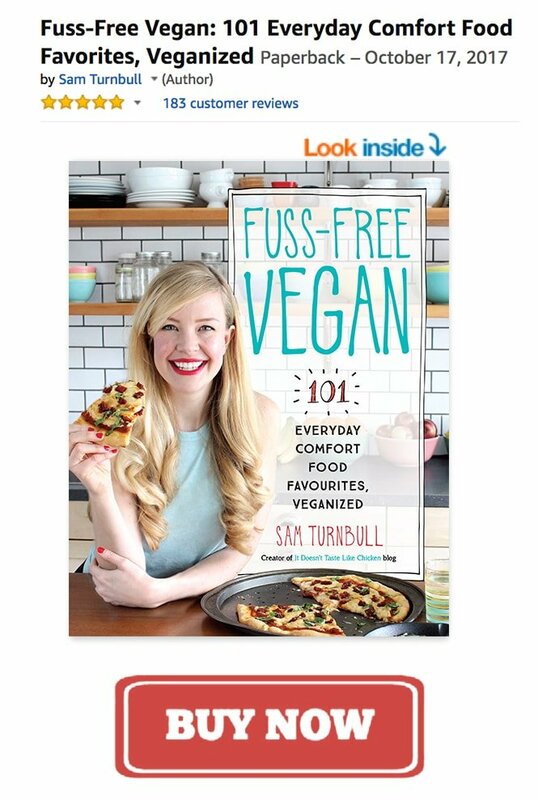 So happy you are enjoying the recipes! I’ve never commented on a recipe but this was AMAZING. Tasted exactly like my favourite local pho, can already tell I will be making this alot! Simply Amazing!! Just made it and it is perfect however I love the flavor of serrano peppers and used those instead. Do you think you could double the recipe and make the broth in a slow cooker? Seems like the perfect thing to make in a big batch and freeze individual portions of. Yes I think that would work just fine. Enjoy! This seems like a great recipe to make in bulk then freeze in 2-4 cup servings, then when you just want some, just defrost and heat up! What do you use for the vegetable broth? Any particular brand? Any brand will work, so whatever your favourite is. I like Pacific, and Presidents Choice (Canada only). Sam! This is so delicious I can not stop eating it!! I’m so glad you enjoyed it! You can never go wrong with a giant bowl of noodle soup! This is fantastic! Thank you. Just had two huge bowls. Yay! So glad you enjoyed it. I don’t think I can ever have too much pho! OH WOW! How amazing does this look? Pho is incredible, and I can’t stand how the “Veggie Phos” at stores are still served with beef broth! 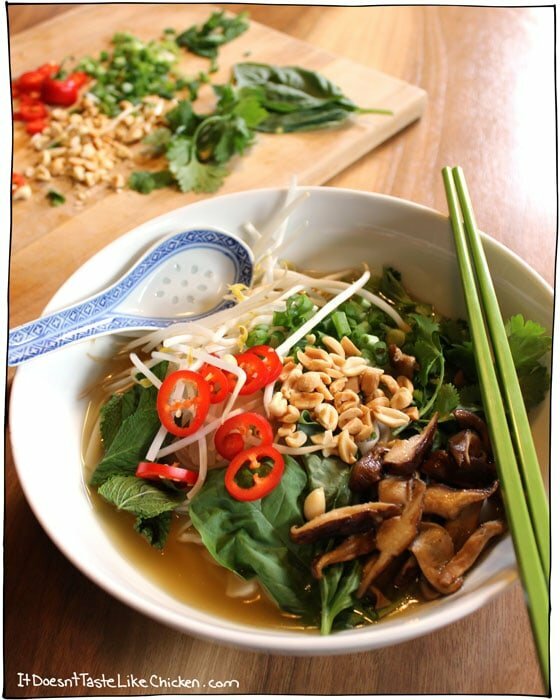 This post has been so informative as I’ve always wanted to make Pho at home. Love love love mine with extra bean sprouts, so delish! Yes, it’s so annoying when veggie pho is made with beef broth, or any vegetable soup for that matter. I’m so glad you found the post helpful, I love making pho. So comforting, yet so healthy! I always find it difficult to pronounce Pho correctly, as in “phuh”. But I sure don’t find it difficult to eat! Definitely trying out this recipe, and love the tip above about toasting the spices first. Thanks for the recipe, Sam! Haha! I’m the same Beth! I always pronounce it worn. Enjoy your “phuh”! Looks yum – going to give it a go…. This looks like the perfectly (easy) winter’s night comforting food. Yum! Thank you! It really is. It took me awhile to perfect, but now it’s my go to. (Luckily I worked out all the kinks for you). Just finished making and eating this dish – was delicious. Didn’t have the Star Anise this time round but will be adding that next time. This will be on my go to list for a yummy cold day meal. Thanks Sam…..
Yay! So glad you enjoyed it LaDonne! Thanks for coming back and leaving your review! It’s definitely one of. My go to cold day dishes! Star anise will just add another awesome layer of spice in this broth. Yum! If you toast the spices in your stock pot before you add the other ingredients, it gets even better. That is the traditional way to do it. All the oils come out and that’s when the magic happens. Love Pho! Awesome! Go for it. Pho is the best! Uh.. YUM! Omar is the same – he could eat a bowl every single night, which is nuts because he doesn’t otherwise “like soup”.. or so he claims. 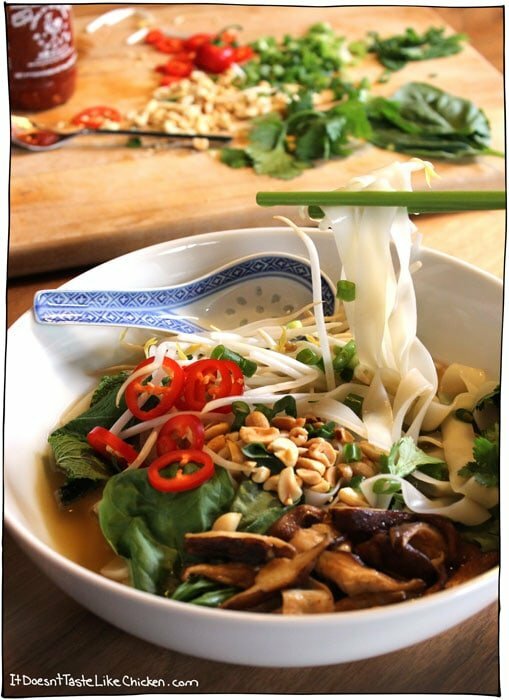 YupItsVegan just posted a spaghetti squash vegan pho, like two days ago.. crazy, eh?! Oh really!? That’s so funny, I didn’t see that. Great minds think a like! Haha what is it with boys and pho? Whatever it is, it’s a-ok by me! Yum!! I am so making this.